The Salesforce Source and Destination can be configured in just seconds to easily get data out of and write data to Salesforce. 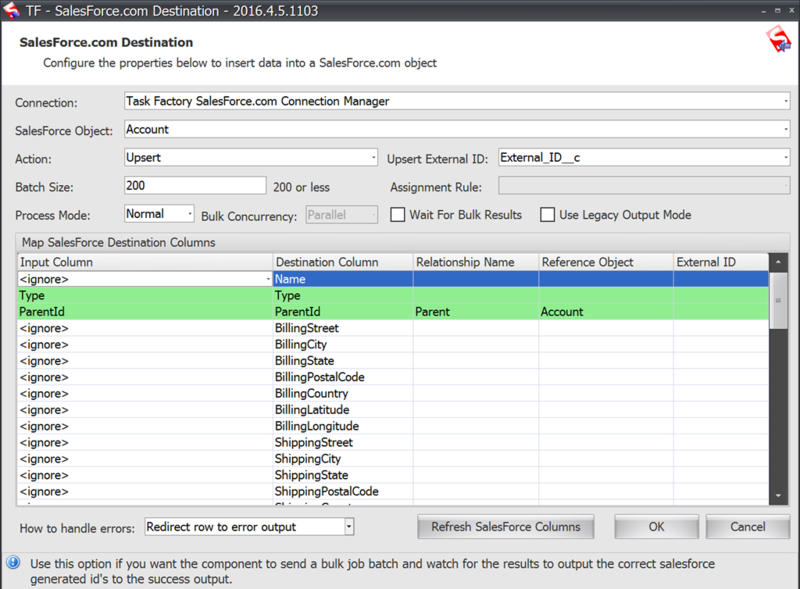 The Task Factory SalesForce.com Source retrieves data from any SalesForce.com object and can be configured in seconds with very little SalesForce.com experience. If you need to import data from Salesforce for in-house processing, the Salesforce.com Source allows you to retrieve any data supported by the Salesforce.com Soap API like leads, accounts, contacts and opportunities right into your SSIS data flow. Within 5 minutes, you’ll be pulling Salesforce data into your local environment. Simply create your connection manager and point to the object you want to retrieve data from a drop-down box. Want more advanced functionality? You can also customize the query and pass variables into the query for ranged retrieval of data. The Salesforce.com Destination is used to send data from your local environment to your Salesforce.com account. 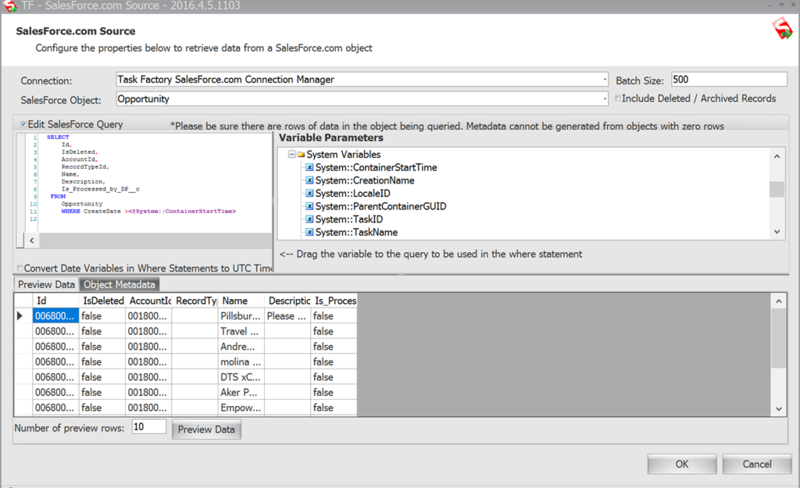 If you need to insert, update, delete, or upsert data into any Salesforce object from within SSIS, then the Salesforce.com Destination makes it super simple with very little configuration. Supports both regular and bulk mode transfer. You can also send errors that might occur due to your data to another part of the data flow for additional cleansing. "The University of Calgary Data Warehouse consists of over two dozen data marts, built upon a decade's worth of ETL programming in IBM Cognos Data Manager. When support for that product ended and we investigated converting all ETL to SSIS, concerns were raised about performance and maintainability in the new toolset. Thus the decision was made to purchase Task Factory; I can say with confidence that halfway into the conversion effort, it has been one of our smartest and most cost-effective software acquisitions in recent memory."